These lightly seasoned Chicken Scallopini cutlets are lightly seasoned and will impress even your fussiest dinner guests and make for a dressed-up meal that everyone will remember. 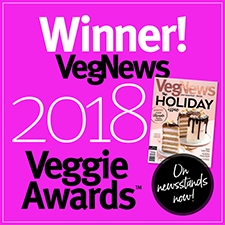 No more boring vegan “chicken” dishes – just sauté, add your favorite sides, and you’ve got a dish that not only looks and tastes incredible, it’s good for you, too! Each 10 oz. 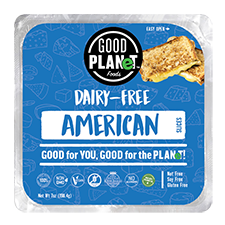 (285g) package contains 4 pieces of vegan chicken scallopini. $5.49 per package. Gluten-free. Ingredients: Gardein Chicken: Water, soy protein isolate (non-GMO), expeller pressed canola oil, modified vegetable gum, tapioca starch, potato starch, organic cane sugar, yeast extract, natural flavors (from plant sources), carrot fiber, salt, quinoa, gluten-free soy sauce, vinegar, garlic powder, onion powder, natural vegan colors. Rub: Dehydrated vegetable (red bell pepper, garlic, onion), spices, organic cane sugar, salt. From Anonymous of orlando, Florida on 1/28/2018 . From Hilly of Port st lucie, Florida on 12/10/2015 . I love this product! I use them as a salad topper, in pasta, in a sandwich, or even alone with a side of vegetables. I've used Asian sauces and Italian sauces with it, I can't wait to put it in a curry. Highly recommended. Great texture, and I prefer the mild flavor so it can be seasoned however I like it. These are so delicious! I can't get enough of them. My local grocery store carried them for a short time before taking them away from me. I was not happy. They make wonderful sandwiches and salad toppers. I think this is actually my favorite Gardein product. Very highly recommended. The best chicken analogue out there! From A. Jean Clayton of Centerville, Ohio on 1/5/2014 . I have tried quite a few meat analogues since going vegan, mostly because my husband is NOT, so I try to find decent compromises. 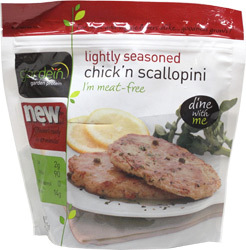 No matter how you use this chick'n scallopini, it works out great. Great texture, great taste in recipes. My favorite use is the Picatta recipe from "The Conscious Cook", but it's also great as "chicken" salad, fried chicken sandwiches, buffalo wraps, etc. From mariah of comstock park, Michigan on 3/16/2013 . I really like this product. I like them better in recipes instead of on their own because they tend to run a little bland for me, the texture and smell is great tho!